The Grand Duchy of Luxembourg, though small, has a long and complex past. Founded in the 10th century under by the Count of Ardennes, fortifications in the area go back as far as the Roman era. Through a thousand years of the country changing hands and becoming a hotbed of European political movement, it would officially become a nation-state in its own entity in 1815. It is now the seat of the European Court of Justice and continues to be an intriguing melting pot of both French and German culture. It has spawned numerous artistic and cultural movements and it boasts a long list of poets, artists, and musicians. There are also many attractions in Luxembourg for visitors traveling to the country. Here are ten places you absolutely must see when visiting this important UNESCO listed country. What is your favorite attraction in Luxembourg? 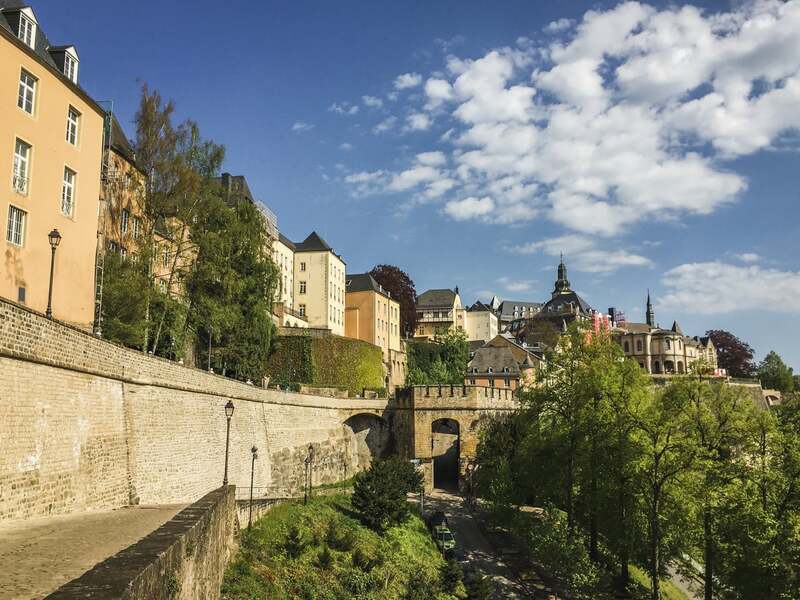 The old town of Luxembourg has been a UNESCO World Heritage site since 1994, and it’s not difficult to see why. Located in the area once home to the ancient fortress, much of the old quarter retains an old world charm. 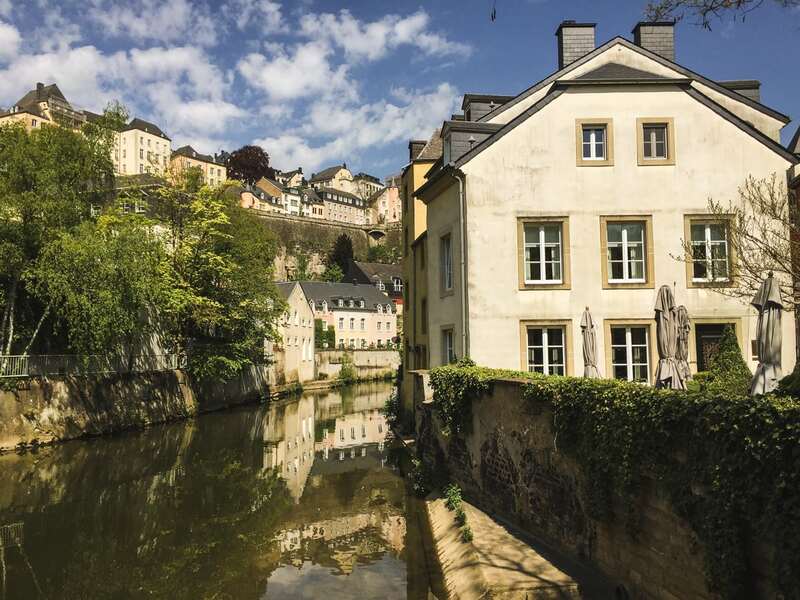 It has carefully laid out gardens and the sublime Adolphe Bridge, which has become something of an icon in Luxembourg’s booming tourist trade. Wandering its cobbled streets you’ll be surrounded some gorgeous old homes, cross many old bridges, and meander down atmospheric alleyways. Taking a look around the old town will give you a sense of the wonder that this unique country has to offer and certainly not to be missed. There’s a reason why most of the photos you’ll see of Luxembourg are taken in this area, and you’ll soon fall under its spell. It truly is one of the main attractions in Luxembourg, and possibly all of Europe. 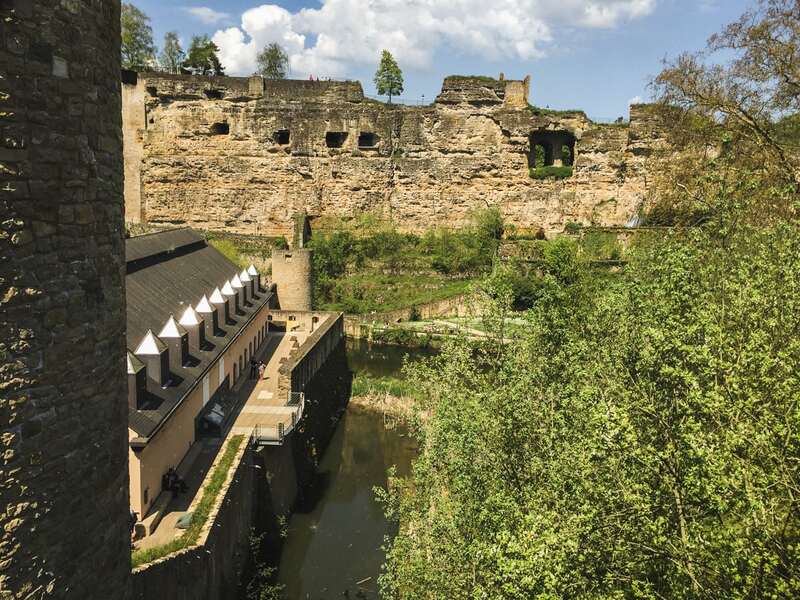 The Bock Casemates are located in the Bock cliff over the old town and are a must-see attraction in Luxembourg. Easily accessible through the former location of the Montee de Clausen, the casemates were carved out underneath the fortifications by the Spanish in the 17th and 18th century. The tunnels are a 21-kilometer network of hewn caves which could be used in times of siege. They were capable of sheltering soldiers from bombardment, and to this end could also be used to house the facilities that were needed to weather out sieges. This included stables, slaughterhouses, and equipment storage. Most of the passages are fully explorable and you can regularly take interesting and informative guided tours through the caves. Up above you can visit the ruins of the old castle and imagine what it must have been like to be under siege hundreds of years ago. 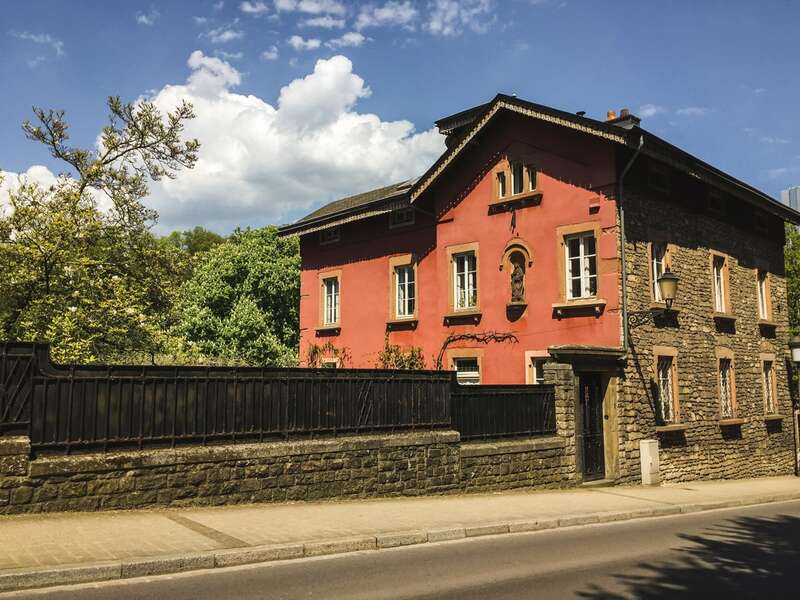 The town of Echternach, which sits upon the River Sûre, is home to the beautiful Benedictine Abbey which has stood in this spot since the seventh century. The abbey today is made up of four wings around a courtyard and houses the Basilica, which as an important religious site, contains the final resting place of St Willebrord who founded the abbey and acts as the country’s patron saint. The museum is located within the cellars, and here you’ll find some exquisite early manuscripts, atmospheric medieval rooms and learn about the history of the area via interactive presentations. Not far from the town itself are some beautiful areas of natural beauty, bordering with Germany. 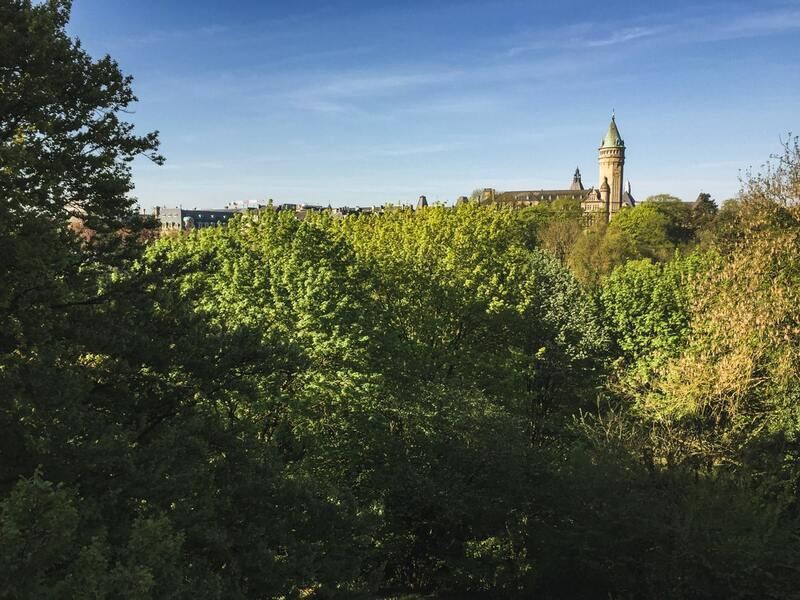 Here you can ramble along woodland paths, taking in rock formations and waterfalls as you make your way to some excellent viewpoints of the city. Built in the 17th century, the beautiful gothic style Notre Dame Cathedral has become emblematic of Luxembourg. Founded by Jesuit priests it is notable for some Renaissance features added later, giving it a distinctive look. The north gate of the cathedral is beautifully embellished with stained glass from the 19th and 20th centuries. The organ tribune, which dates back to the early 17th century is surrounded by some exquisitely carved angels. Along with a sobering monument to the victims of deportation and the resistance fighters of the second world war, you’ll also find more contemporary sculpture. If you venture into the crypt, you’ll also find the graves of Luxembourg’s royal family, watched over by the sculptures of two lions. As the town’s only Cathedral it is certainly an area not to be missed. The city, having been home to countless artists, the Grand Duke Jean Museum of Modern Art is of special cultural significance. Within its exhibits, you’ll find examples of work from some of the world’s most revered modern artists such as Julian Schnabel, Hilla Becher, Blinky Palermo, and Andy Warhol. Sitting on the site of the former Fort Thungen, it was opened in 2006 following extensive design work by some leading architects and interior designers. Viewed from afar it lends an interesting contrast to the surrounding natural landscape, built with stone and glass and with a magnificent, glass canopy ensuring plenty of natural light gets in with which you can view the artworks inside. 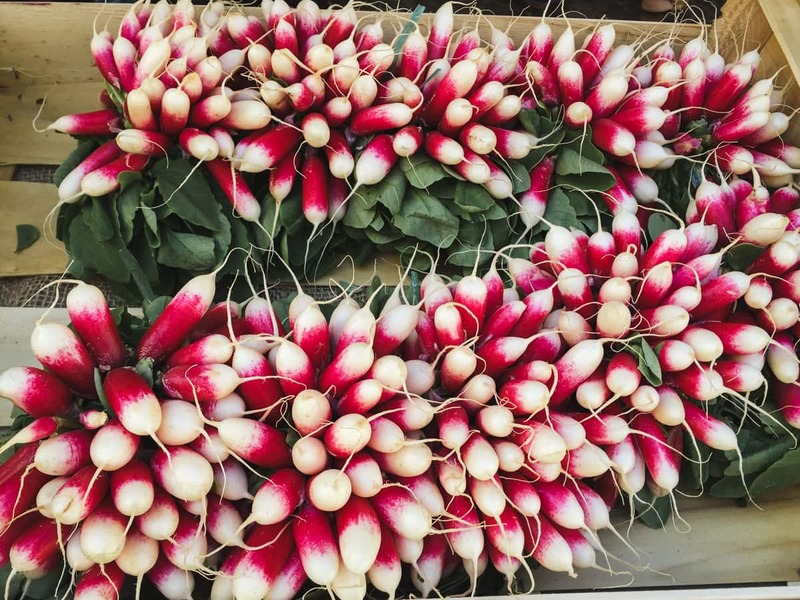 Whether you are already versed in modern art or merely just interested, there are opportunities to learn about some of the artists within as there are regular guided tours. Your visit to Luxembourg wouldn’t be complete without getting a good understanding of its rich and complex history, and there’s no better place to do that than the Luxembourg City History Museum. Founded in 1996, the four 17th to 19th-century houses in which the museum resides chart the history of the city and country since its inception in the 10th century. The exhibitions detail the early settlers of the area and map the city’s rise through the centuries to the place of importance in the European community it occupies in the present day. As well as important information on the city’s cultural heritage, there are also exhibitions on Luxembourg’s exquisite and eclectic architecture, much of which can be seen from the confines of the museum as it also offers some very fine views of the city. Located in the city of Vianden, the castle, once a feudal manor of its namesake, dates back to the founding of Luxembourg. Revered by many architectural historians, the Chateau de Vianden is both an impressive fortress and a beautiful ancient home, much of which remains in very good condition. Whilst there you can walk along the medieval outer walls and marvel at the guard’s towers which rise above it. You’ll discover the 13th-century gothic church which has been lovingly restored to its former glory. This contains both an exhibition of meticulously carved gems and a small art museum. Nearby you can also visit the house in which Victor Hugo once lived in exile, which contains a collection of Hugo memorabilia. Known as ‘the most beautiful balcony in Europe’, the walls of Corniche give you the best view of the old city down below. As you walk along the ramparts you’ll see old aristocratic houses and churches, including the Abbey of Neumünster which contains the 14th century ‘black virgin’ and a famous 18th-century organ near the cloister of Limoges. 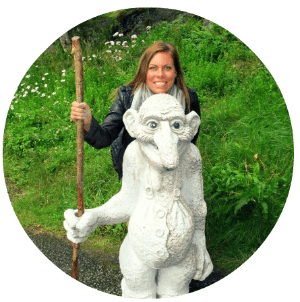 One of the most interesting spots is the Gate of the Grund which sits in front of a central historic district, which itself contains many interesting curiosities and extraordinary places to visit, as well as some fine dining in the evenings. Some of the buildings found here are part of the ancient hospice founded in 1309 by the Holy Roman Emperor Henry 7th, known as the Hospice de St Jean. This is a can’t-miss Luxembourg attraction. The Place Guillaume has been a hub of commerce and activity in the city since the middle ages. 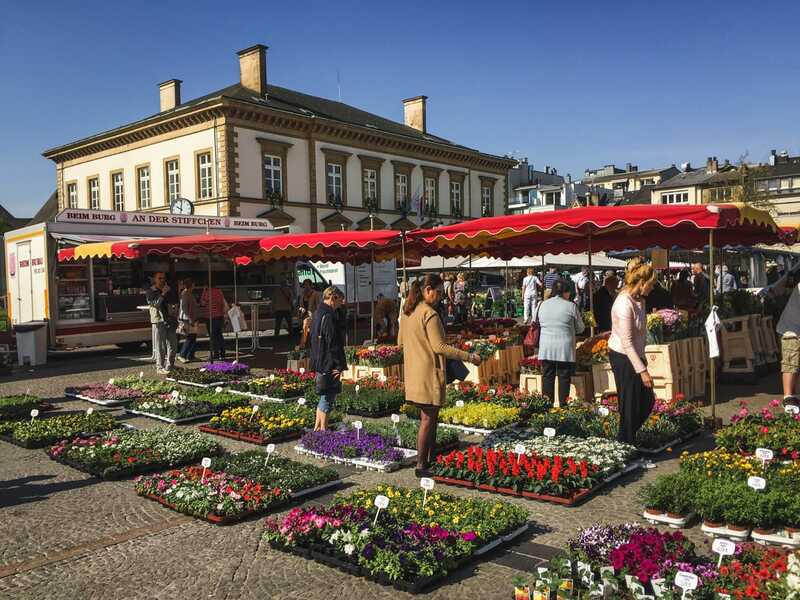 It is one of Luxembourg’s largest open spaces and home to regular markets, famous for plants, flowers as well as some excellent local cuisine. Completely closed to vehicles it is the perfect spot to take in the culture of Luxembourg as you observe the locals going about their daily business, but you can also take in some iconic local landmarks. It is here you’ll find the Town Hall fronted by the famous Tremont Lions and the beautiful facade of the House of Raville. There is the austere looming equestrian statue of William II, the areas namesake and once King of Holland, and you can view the Spanish Turret with its adjoining cavalry barracks. The Passerelle Viaduc, also known as the Luxembourg Viaduct, at the Plateau du St Esprit is a fantastic place to take in the views of the city. Built between 1859 and 1861, it was created to connect the center of Luxembourg with the then new railway station. Towering at 45 meters above the Petrusse valley floor, it offers some stunning views of both the city and the surrounding countryside. From here you can get your bearings whilst you take in the view, and after you’ve watched the sun go down you can visit the many fine restaurants nearby, or take in the Sacre Coeur Church built into the rock face or the ancient Chappelle Saint Quirin. If you’ve overloaded on all the culture the area has to offer, there is an excellent shopping street on the road that travels south from the viaduct. Martina Sanchez is a writer of articles on SEO, digital marketing and content marketing which she publishes at her blog Researchpapersuk. She writes for Lucky Assignments and Gum Essays.